Welcome to Day 1 of MCT's 58th Release Sneak Peeks! I am lovin' these candy corns, I used the smaller one to create the background and the larger one is on the black layer. There are two candy corn dies with this set. OMG Miss Brigit What a Super Adorable card. Fabulous Stamping and coloring job....loving the ways you used all of Miss Emma's goodies!! Miss Brigit, my English is not so good, but I'll give it a try. What a candery card you've made! I'll think we don't have that sort of candy in the Netherlands? Cute card! Love the background as well as the goggle eyes. What a cute card. Looking forward to start the tricks and treats! Brigit your card is super cute!!!! I love the handmade background paper! So fun and bright! And your cute little candy corn guy is super cute with his googly eyes!!! LOVE IT! Thank you for sharing! Have a great week! Oh my goodness... I just love the googly eyes!! This is just adorable, Brigit! Love!!! Ms. Brigit, I always look forward to seeing what you come up with. Always adorable. Cute card, luv those googly eyes. I love your background and the goggley eyes are adorable. I like the skewed sentiment strip...nice design. Oh holy cuteness!! I am in love with this set!! I MUST OWN IT!! I love Candy Corn!! I absolutely love the super fun candy corn background!! I absolutely love your card!! So cute and those jiggle eyes make it so much fun! Very cute with the googly eyes and the candy corn background. Very cut set for Halloween cards. Oh that is super sweet! love, love, love the eyes! Adorable! fun to put a face on some of them. Such a fun card, Brigit!! I love it!!! Great coloring on this cute card! 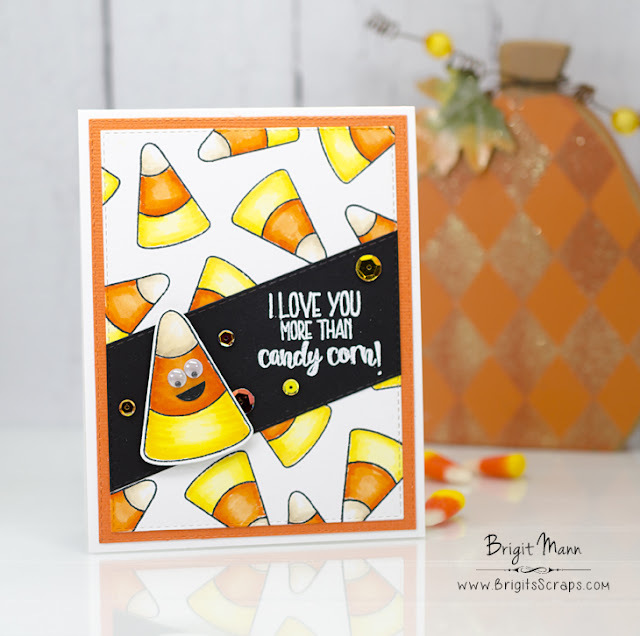 Love those adorable candy corn stamps! Oh WOW! I was so happy to see Hallowe'en Candy Corn being featured today. Hallowe'en is one of my favourite times of the year, next to Christmas. Love your card and how you used the images to make your background too! The google eyes, cracked me up! LOL! lovin the shaker eyes and the black diagonal just pops!!!! wonderful!!! Cute card! Love the googly eyes! Totally LOVE this sweet card Brigit!